The indicators in this group deal with vehicle fleet composition (size, age and compliance with EU environmental standards, fuel use), vehicle technology, utilisation patterns (occupancy rates, load factors and distance driven) and overall fleet performance in terms of energy intensity and eco-efficiency. Auto-Oil Programme I and II (COM(95)689): aim to improve the energy and emission efficiency of road transport and improve the quality of fuels (see Group 1). The voluntary agreement with the car industry (COM(98)495): aims to reduce CO2 emissions from new passenger cars (see Group 1). EU strategies for the Citizens’ Network (CEC, 1995): aims to improve the utilisation efficiency of passenger car transport (e.g. to develop traffic priority for vehicles with more than one person and initiatives to promote car-sharing). Some Member States have introduced schemes to encourage scrapping of old vehicles (i.e. to remove vehicles with the worst environmental performance). The Proposal for a Directive on end-of-life vehicles ((CEC, 1997), amended by COM (99) 176) would make producers liable for the recycling of end-of-life vehicles. International Civil Aviation Organization (ICAO) standards on noise from aircraft are being strengthened so as to phase out the noisiest. Similarly, ICAO sets standards on air emissions from aircraft. The recent Commission Communication on air transport and the environment (CEC, 1999), announces a strategy to enhance technical standards and rules for aircraft (for noise and gaseous emissions). Under the International Convention for the Prevention of Pollution from Ships (MARPOL), a new protocol to reduce pollution emissions (NOx, SO2) from ships was proposed in 1997 but has not yet been adopted. ALTENER II (COM(97)550, COM(99)212): aims to promote increased use of renewable fuels. The most significant success in this group is the phasing-out of leaded petrol; the market share of unleaded petrol reached 75 % in 1997 and leaded petrol is expected to be completely phased out by 2005. Although vehicle fuel efficiency, related primarily to technology, has improved in all modes, changes in fleet composition (e.g. heavier cars) and vehicle utilisation (i.e. decreasing occupancy rates and low load factors) have absorbed much of the impact in most countries. 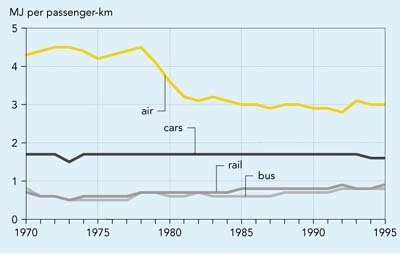 As a result, the energy intensity of road and rail passenger and freight transport has not improved since the beginning of the 1970s. The energy intensity of air transport achieved a significant improvement in the 1970s, but has stagnated since then. Road freight transport and air passenger transport are the modes with the highest energy intensity. Rail and ship freight transport are still much more energy-efficient than road freight transport. A further factor that limits the benefits of new technologies has been the slow market penetration of new cars; the average age of the car fleet increased from 6.1 years in 1980 to 7.0 years in 1997. Several Member States (Greece, Denmark, Spain, France, Ireland and Italy) have introduced car-scrapping schemes during the 1990s. Of course such programmes only result in environmental improvements if the new vehicles have emission rates substantially better than older models and if the environmental impact of vehicle construction and dismantling processes is reduced. The proposed Directive on end-of-life vehicles aims to ensure this. Data on eco-efficiency of passenger and freight transport is scarce, but in Austria and the Netherlands specific emissions of NOx and NMVOCs from road as well as rail and air transport have dropped significantly. The main causes are the introduction of EU standards on emissions from new passenger cars (the catalytic converter) and diesel vehicles. This result depends on the characteristics of the vehicle fleets – 76 % of the Austrian and Dutch car fleet is fitted with catalytic converters, compared with an EU average of 48 %. In 1995 70 % of diesel-driven cars and 23 % of heavy-duty vehicles complied with EURO I, and more than 90 % of the EU aircraft fleet complied with the highest noise standard for aircraft. Stringent technical and fuel standards have proved to be powerful policy instruments for curbing some of the environmental impacts of transport. However, reaping the full benefits of technological improvements and higher standards requires economic and other incentives to regulate transport demand. For example an increase in energy efficiency lowers fuel costs per km, encourages more transport, and therefore undermines the benefits. For references, please go to https://www.eea.europa.eu/publications/ENVISSUENo12/page026.html or scan the QR code.